In summer, 2007, I flew to India as a short-term mission team leader by the grace of God. What I felt there was that God prepared tremendous blessings overseas, just as He had done in Canaan. There were so many truth-seeking people who were waiting for us, and Zion was filled with plentiful fruits every day; it was really amazing and unbelievable. Preaching in India left me with a strong, impressive memory, which was engraved on my heart as a desire for overseas mission. As someone said, “Dreams come true,” my dream had finally come true! It has already been a year since I came to the Philippines in obedience to God’s holy command. God always leads His children to the way of blessing. Indeed, there were overflowing blessings and amazing works prepared for me in the land which I arrived under God’s guidance. The Philippines is the only Catholic nation in Asia. Roman Catholicism was first introduced to the Philippines in the 16th century when it was under Spanish colonial rule. Since then, Catholicism has been deeply embedded in every aspect of the lives of Filipino people for hundreds of years; their indigenous religions were replaced by Roman Catholicism, which has become a new religion for them and has formed a part of their culture and has finally become an integral part of their daily life. Now, many Protestant denominations have also been introduced and there are quite a number of Muslims as well in the Philippines, but Catholicism still has very deep and ingrained roots in the country. While preaching the truth to people, we could feel how deeply they were steeped in Catholicism. Though they read the words of the Bible, they could not distinguish the truth and did not even understand why they should obey the words of the Bible, instead of the doctrines of the Catholic Church. On top of that, they frequently broke their promises to study God’s word again, probably because of their relaxed, easy-going attitude towards life, like most other people in hot countries. Despite that, we did not feel discouraged, but continued to preach to them, being thankful to them because they stopped what they were doing and willingly listened to us when we told them that we were preaching God’s word. As God said, “My sheep listen to my voice,” God’s children heard His voice contained in the truth and started to wake up one after another. Their reverence for God was so deep that they obediently accepted God’s will and followed it without hesitation once they received the truth. Prices in the Philippines are too high, so most of our members live on a tight budget even though all their family members work to earn money. So it is not easy for them to attend worship services, and they find it even harder to make time to preach the gospel. However, those who are firm in their faith try to keep the Sabbath by every means possible as God said, “Remember the Sabbath day by keeping it holy,” and they even reduce their sleep and rest time to preach the truth in obedience to God’s command, “Preach the gospel in Samaria and to the ends of the earth.” They are all so fervent for the gospel. Since they always preach the gospel boldly, they sometimes face fierce opposition and persecution, but they never give up on the mission of preaching the gospel although their hearts are wounded or hurt. They wipe their tears and get up, dusting themselves off and smiling brightly, and jump in the front line of the gospel again. It is really touching to see them do so. At the beginning, I was a bit worried that the strong religious inclination of Filipinos would be an obstacle to the gospel. In fact, it affected the gospel work a little bit. However, I came to realize that my worry was groundless as I saw the members being born again to have a deeper and stronger faith than their previous religious beliefs which had been handed down for such a long time. While working with the members who were burning with fervor, I had no time to feel discouraged though people did not listen or realize. God, who knows the end from the beginning, never sends us, His children, to an impossible place, and even if we face a difficult situation, God helps us to handle it. The will of God is surely fulfilled regardless of our environment and circumstances. Nothing can be an obstacle to the work of God. I realized this more clearly while a new temple was being built. When I first came here, the most urgent thing I had to do was to finish the construction of the temple. It had been quite a long time since the commencement of the construction of the new Church building with four stories above the ground through God’s blessing. However, the construction was halted due to some complicated problems. From the house Church, I could see the site for the new temple through the window. Whenever I saw the framework covered with dust, I had a lot of mixed emotions at the thought that I did not fully carry out the mission given to me by God. The members seemed more worried than me. Although they did not say anything, I could see in their eyes how sorry they felt towards God, thinking, ‘God has granted us so much blessing, but we are still lacking in many ways. That’s probably why the construction has been suspended.’ They silently devoted themselves to the gospel without grumbling or complaining, and I earnestly hoped that the construction work would start again for them. While making every effort to recommence the building of the temple quickly, I tried to figure out how to comfort and encourage the members. Before I came to the Philippines, Mother asked me to give much love to brothers and sisters. I could see why Mother emphasized love for them. So, I tried to convey Mother’s love to the members. But it didn’t mean that I did something special for them. All I did was greet them warmly, say encouraging words to them while holding their hands, and smile a lot, just as Mother always does to us. I also spent much time listening to each and every member rather than telling them my own opinion. While having a heart-to-heart talk, we felt that we became much closer to each other. Then before long, the members picked themselves back up again and worked harder for the gospel, encouraging one another. They regarded each and every soul as precious and spared no efforts to help them grow to be good, mature fruits, earnestly praying for them. “We believe that God has given us an opportunity to find more brothers and sisters before the temple is completed.” Saying that, they preached the gospel vigorously. Meanwhile, at the beginning of this year, the construction work that seemed impossible started again miraculously, contrary to the expectations of the construction-related people. Four months later, the temple was finally completed. This was truly something impossible without God’s help. Since then, many people have been receiving the truth every month. There was something that each member received from God while the big and beautiful temple was being built. That was a vessel of faith deep and great enough to embrace new members. God did not really make us suffer unnecessary hardships. He refined us so that we would become stronger and more beautiful. With Luzon—the largest island in the Philippines—as the center, Zion has been built in each city of South Metro Manila (Manila, Quezon City, Mandaluyong, Las Piñas, and Caloocan), as well as Laoag in the north of Luzon and Baguio in the west of it. Among them, Quezon City is the most densely populated city in the country. Though the gospel has spread in many districts and towns of Quezon City and a big temple has also been established, there are still so many regions where the light of the gospel has not yet shone. So, we can say that the gospel in Quezon City has just begun in earnest. In fact, it was not easy for the members to pay attention to other regions because their circumstances were not so favorable, although they had a strong desire to take the gospel to places where it had not yet been heard. 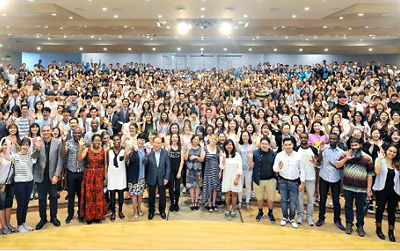 It was a short-term mission team from Korea that kindled the fire of the Holy Spirit in their hearts. Korean members came all the way to preach the gospel, although it took them so much time and money. This fact itself became a good example for them, and the short-term mission team’s earnest efforts to preach the truth by any means possible, even though they were not good at speaking English, also touched the local members deeply. As several more short-term mission teams came and returned, the local members were determined in their hearts: ‘Let us take care of the gospel in the Philippines by ourselves.’ Now they participate in short-term missions, saying, “We speak English fluently and live in the Philippines, so there is no reason why we can’t preach in other regions of our country,” and some of them even manage the house Churches. Recently, three house Churches were established in Quezon City almost at the same time—in La Roma, Pagasa, and Fairview. 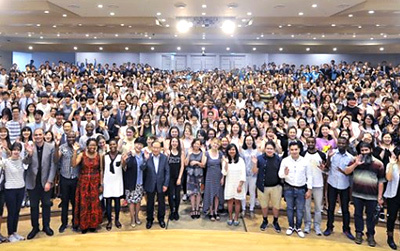 Right after the house Churches were established, another short-term mission team came from Korea. As the short-term mission team and the local members put their strength together and preached the gospel, the number of members continuously doubled. The Bible says, “Can a country be born in a day or a nation be brought forth in a moment? Yet no sooner is Zion in labor than she gives birth to her children” (Isa 66:8). Before, I could not fully understand the meaning of this verse, just wondering, ‘How can it be possible?’ But now I can really understand it. I believe that God is pleased to see all the members of Zion throughout the world being united together, regardless of national borders, languages, and cultures, and pours out the Holy Spirit abundantly on them. Now our brothers and sisters in Quezon City do not expect anyone else to preach the truth instead of them. 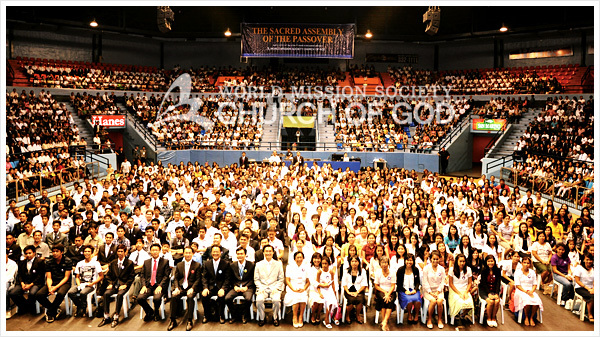 Though Zion has not yet been established in many cities including Gapan City and Tarlac located inland of Luzon Island, there are already some brothers and sisters in those regions who have been keeping the faith since they received the truth through their families in Quezon City and some other regions. They eagerly hope that they will set up the banner of Zion quickly in each and every region so that they can fulfill the gospel in the Philippines as soon as possible. At the end of last year, there was an education gathering for the young adult members from each Church in the Philippines, who dreamed of being part of the pastoral staff. There will be another gathering soon, and it is expected that more members will participate in it. Now the members are preparing themselves fully so that they can respond to God’s call immediately when God says, “Who will go for us?” So, I am sure that the gospel will spread throughout the Philippines very soon. This year, the members from five Churches in Metro Manila celebrated the Passover together. 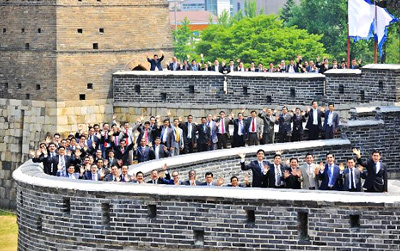 More than 2,000 members were gathered in one place. It was the first time that such a large number of members were gathered together since the gospel started to be preached in the Philippines. They were all surprised and said, “We used to feel like everything seemed to go very slow here. So, we didn’t really know that there are so many brothers and sisters found here. It’s really amazing to see them all at once.” Then they gave glory to Elohim for carrying out the gospel work quietly but swiftly. Both the members and I feel sad and heartbroken, but Mother must be even more grieved and heartbroken than anyone else. As the gospel is spreading rapidly throughout the world, the number of those who visit Korea increases every year. However, there must always be a sadness in Mother’s heart because of Her children whom She has not yet been able to meet and hug. Until the gospel is fulfilled, Mother’s suffering and our yearning for Mother cannot be shaken off. To shorten the time of sorrow, we must accomplish world evangelism quickly. For this, we should find our lost heavenly family members and also be born again fully enough to have the divine nature, as the firstborn of heaven, worthy to receive the blessings of the heavenly kingdom. These days I realize deeply that the Ten Talent Mission is an opportunity for each of us to be changed into a person with a loving heart like that of God. The Ten Talent Mission is the work of finding those who will be saved together with us. Awakening a soul, leading the soul to the way of truth, and helping that soul grow and mature in faith—this is impossible without love. Eventually, the mission of ten talents and world evangelism will be accomplished when we all love our brothers and sisters just as we love Father and Mother, take pity on dying souls, and become born again as the fruits of perfect love. While working together with the members in Quezon City, I experience the great power of love every day. I truly give thanks to Elohim for entrusting me with the gospel mission that will be accomplished through love. For the past one year, I had a great deal of trouble because of the language barrier and cultural differences. What I learned during that time is this lesson: If we move as God commands, everything will go well. I will always pay attention to the words of Mother and fulfill the gospel in the Philippines quickly by preaching the gospel far and wide, so that no one will fail to be saved without hearing the good news of salvation.